The fine folks over at Vue Weekly asked us what we listen to. Check out our answers here! These five guys from Calgary just want to make music fun, which means celebratory rock and energetic live shows. The band members often end up injuring themselves in the process, but hey, that’s rock ‘n’ roll, right? Prior to Napalmpom’s show in Edmonton, guitarist Shawn Petsche shared his soundtrack picks with Vue. Morning: I like to wake up to a soaring voice that can nudge me towards my day as opposed to pushing me headfirst into it. Lately, that’s been via one of the great American rock ‘n’ roll bands, Los Lobos, and the always stunning Emmylou Harris. Noon: We’re just locking down the final mixes of our debut LP. Normally I’d say that too much of my day is spent listening to my own band, but lucky for me, I still kind of love listening to it. Otherwise, it’s the greatest Canadian rock ‘n’ roll album ever recorded, Tricky Woo’s Sometimes I Cry. Night: When we’re not playing shows, I find it hard to stay up much past 11 pm. I prefer to wind down with something like the Psi Factor & The Cougar podcast. It’s Jon Cummins (USA Out Of Vietnam, Bionic, Doughboys), Simon Nixon (Royal Mountain Band) and Jace Lasek (Besnard Lakes) ramblin’ on about their experiences opening for Kiss or eating hot wings without much regard for what makes good radio—thus making for really good radio. Morning: I usually need to be re-energized with music that inspires me. I’d probably go for something new, like UBT’s Ego Orientation and something classic, like Roky Erickson & The Aliens’ The Evil One. Noon: The Best Show on WFMU is everything I need to hear on the road. Equal parts encyclopedic music history, lo-fi talk radio and mind-bendingly odd comedy, Scharpling and Wurster are like two extra friends in the van to share inside jokes with. One of the great works of art of our generation. 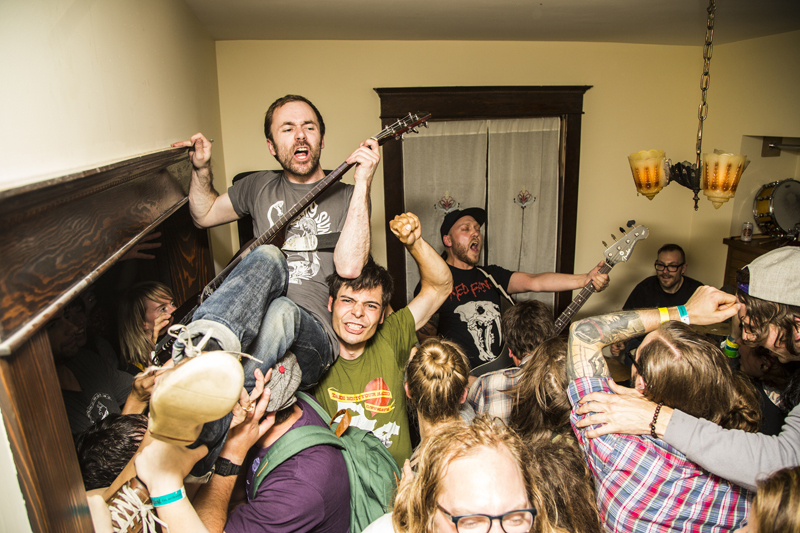 Other than that, nothing screams touring Canada quite like Thrush Hermit’s Clayton Park. Big riffs and melodies like whoa, it’s a love letter to Canada and rock ‘n’ roll that should’ve been huge. Night: Truthfully, I prefer to hear what my bandmates are into rather than control the dial. But, when it’s really late at night and I’m driving, I like something I can really immerse myself in, whether it’s the intimacy of Townes Van Zandt’s Live At The Old Quarter or the awe-inspiring and utterly humbling The Seer from Swans.